Oops. 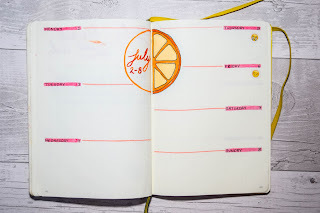 Once again, this post is a little, but nevertheless here it is: my bullet journal set up for July. 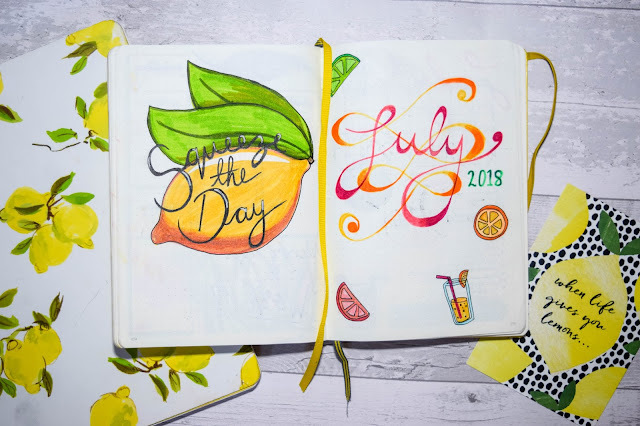 I started designing these pages mid June and for some reason lemons came to mind. It wasn't one I was planning on but it's definitely one of my favourite ones so far, and one I've spent the most time on. 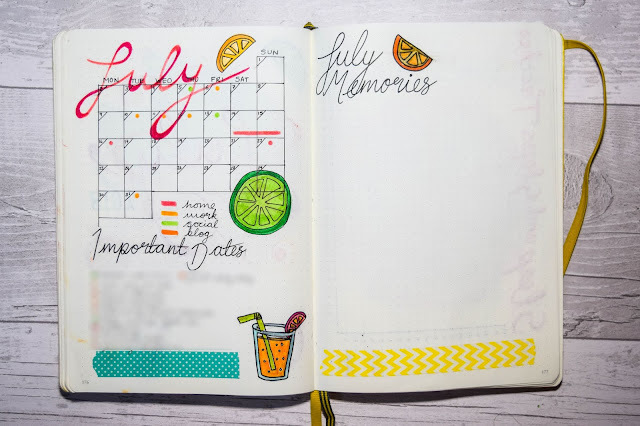 July is an exciting month for me and I've already began filling these pages in to keep my little self organised. Let's run through what July's set up looks like and why July is my busiest month yet! 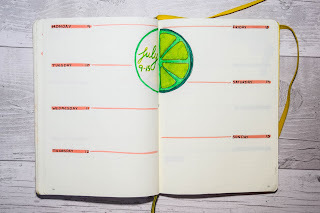 I started this month's theme by writing out the word July. I originally wrote it out in a light pink but then added a little dimension with a darker pink for an ombré effect. I loved the ombré so much, I added the orange and yellow linage behind it for some extra interest and to keep the ombré theme going. 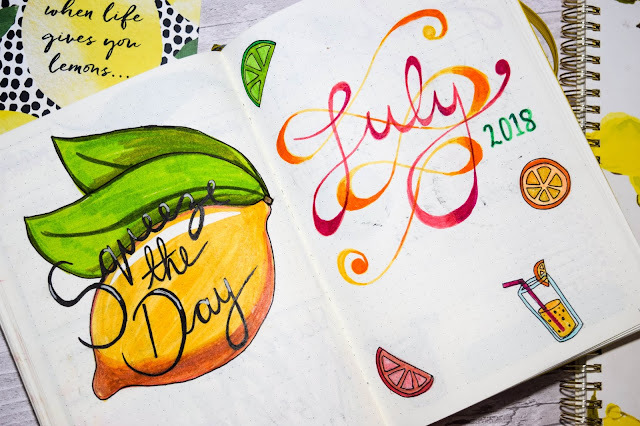 It's a font theme I continued throughout the month of July and one I'm tempted to keep going in other month's themes too. As always, I have an inspirational quote on the intro pages. It's something I do inspired by the Ban.do agendas. (I really want to get another one!) I really liked this quote I found on Pinterest which says, 'Squeeze the Day'. I'm a big fan of puns, and even more so if their inspirational, so this was a favourite and probably began the citrus theme. I drew the lemon and then wrote the quote on top. I was pretty impressed with my lemon drawing. Ha! I've found a set up I like for my monthly spread. 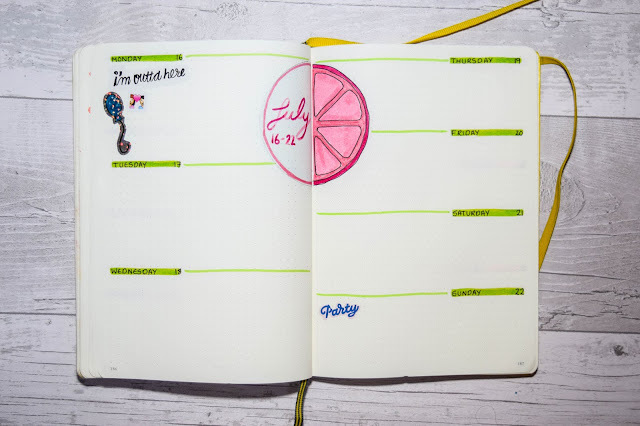 I like having a page for memories and I like having the month overview the way I've set it up with dots and lines to mark important dates and events. I like the colour coding and I like having the dates listed underneath. It's been successful because it works for me and what I need from my monthly overview. It truly does keep me organised! I've used it every month since February and I don't plan on changing it any time soon. This month I've decided to bring back the monthly bucket list. I thought it was fun in December and it was a good reminder of what I wanted to achieve. It was a great motivator and kept me busy. I've got started on a couple of them already which is fun but I want to add some more soon. I adore my trackers for this month too. I like keeping them to the set theme and this time, I made up my own trackers for both the habit and mood trackers. Usually I take inspiration from Pinterest but this time I thought I would see what I could come up with myself. 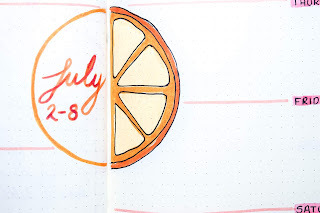 I did this segmented orange thing for my habit tracker and thought it worked out well. 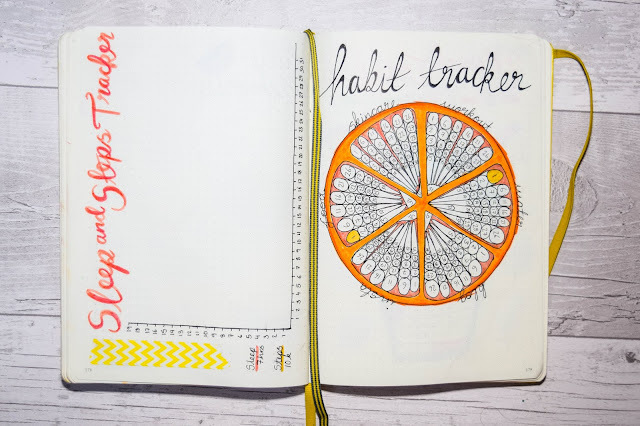 I really like it and works for habit trackers - because of the segments. 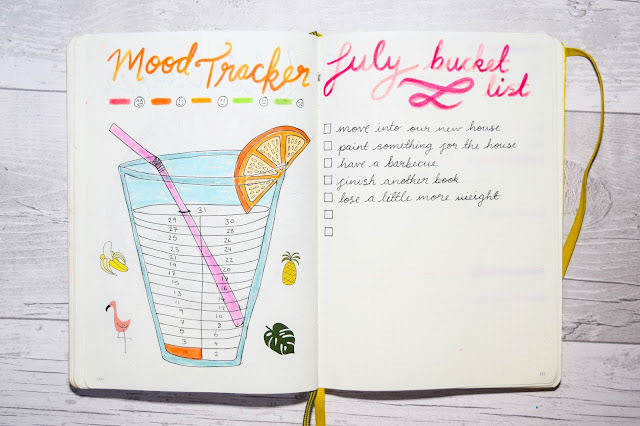 I also love my mood tracker. I had this 'glass-of-juice' idea and unfortunately I couldn't fit in smaller long segments but looking back there was a way I could have done it. I just don't like writing things really small! I added some of my spare Ban.do stickers around it because it was looking a bit bare too. It doesn't take away from the theme too much too. I'm pretty chuffed with my set up for the weeks too! I'm always struggling to find a set up I like for my weekly spreads but I really enjoy this one. 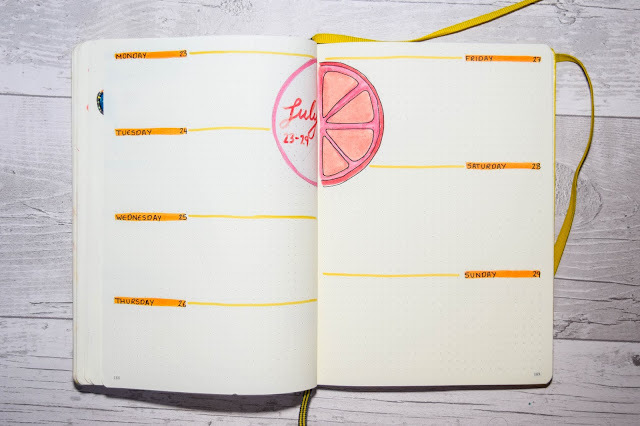 I like that I have more space to write lists and things for each day and I like that I was able to add the citrus fruits somewhere to keep the theme flowing. With such a busy month, I wanted more space to write it and I think I achieved that well here. 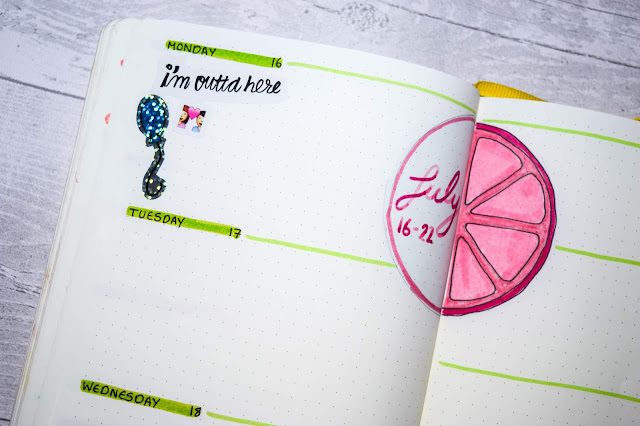 I already added stickers for some things happening on days like next week on Monday when I move to my new house and Sunday for our housewarming barbecue. 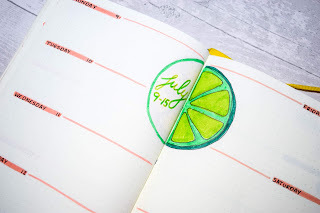 It's all very exciting and I'm about to start adding to-do lists in each day for next week! Overall, I really love this month's theme and think it's one of my favourites along with January and February's themes. I think next I'd like to do something related to homes and things like that because it'll be our first full month in our new house. So I might like to design a house-y type theme next. I'd love to know how many of you bullet journal too. I never thought this would be something I get so into! Share your bullet journals with me. I'd love to know how you set yours up.